Microsoft continues to improve the Skype for Business video experience. 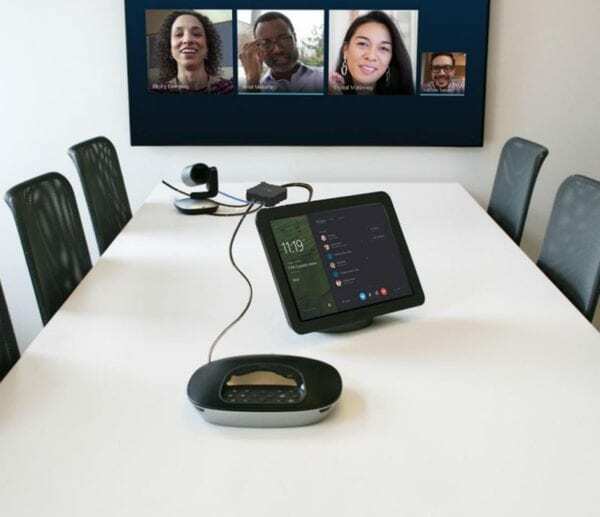 Recent updates include the launch of the Surface Hub, broadcast and translation services, international POPs for conferencing, the upcoming ability for multinational organizations to keep meetings regionalized, and now a new lower cost room system. We got a glimpse of “Project Rigel” during Zig’s keynote at Enterprise Connect last March. The solution now known as the next generation of Skype Room Systems (SRS). The solution is an evolution of the Lync Room System (LRS) announced in 2013. The LRS system utilized touch-screen display(s) that served as both a display panel and white board. A Lync client ran on an embedded Windows device that also used a separate smaller touch-screen for control. The primary OEMs were Smart Technologies and Crestron. The next generation of SRS is very similar, but utilizes lower-cost non-touch displays controlled by a computer running a special version of Windows 10. The large electronic white-board is effectively traded for a lower cost solution. The smaller touch-screen control survives. Logitech will be the first to market with an SRS solution with its SmartDock for Skype for Business. A Microsoft Surface Pro 4 (SP4) PC is the brains of the solution. Microsoft developed a special SfB application for the Surface Pro 4 (SP4) which provides a kiosk-like operation for a conference room. SRS software from Microsoft available for download. The SP4 sits within the Logitech SmartDock that holds, connects, powers, and secures the PC. Separate devices will be required for audio and video. Logitech recommends its own ConferenceCam Group product, but other USB peripherals are supported. Optional expander box for cable management and additional ports. Logitech offers an expander box to assist with cable management. This allows a single 5 meter cable between the dock and the box which then breaks out the separate ports for the other devices. Microsoft believes the solution will start around $2k – that’s a bit low. Figure a $5k starting price for a complete solution that includes the control equipment, HD display, A/V peripherals, and installation. SRS provides a reasonably intuitive interface that most will find easy – even obvious – to use. The distribution model is a bit complex. Logitech provides the SmartDock (and A/V accessories) and Microsoft provides the software and SP4. For some reason these vendors don’t think the customer will be able to assemble this on their own, so they are attempting to restrict distribution to authorized partners. What’s particularly odd about this is the software and SP4 are the complex part, and they are available through mass distribution. It’s the dock which is restricted. I’m all for VARs adding value, but there’s just not a lot of value to add here. I suspect all the parts will be available at dotcoms regardless of intent. Although this uses a standard SP4, it should be viewed as an appliance. The Microsoft load of software on the SP4 is not suitable for third-party applications such as Webex or Citrix. Cables: Because SRS is intended for table-top use, there’s going to be some cabling. The Logitech Smartdock expander box helps, but keep in mind there’s a lot of I/O going to/from the SP4 (camera, power, speaker(s), and microphone(s), and optional video input). LifeSpan: The Smardock is made the for the SP4 which is already about a year old. Will the SP5 be the same form factor? Also note there is no USB-C port. New laptops are moving away from HDMI to USB-C, thus an adapter will be needed for screen sharing. Also, newer 4K video cameras will use USB-C soon. Power Supply. The distribution model involves separately sourced SmartDock and SP4. Both components come with power supplies, but only one is needed. Microsoft sells the SP4 power supplies separately for $80. Competitive UC systems use a similar approach. The key difference is the Logitech ConferenceCam solutions are often used with a BYO PC instead of fixed appliance environment. Several vendors use Intel NUC-based designs for an appliance-like controller, but these don’t have an integrated touch-screen. Cisco’s approach with Spark uses in- room hardware and the user’s smartphone as the controller. Additional SRS options are coming from Crestron and Polycom. The Logitech SmartDock will be the first solution generally available. The Crestron will be integrated into its other product lines, and Polycom will leverage existing hardware early next year. The solution was thought to be an application on a Windows-10 SP4. The actual solution involves a custom version of Windows 10.